Local employer Stelrad – based in Mexborough – last year announced its intention to continue its support for a local charity through its support for the Montagu Cup – a football tournament that is entered each year by teams across South Yorkshire, which can trace its history back more than a century. Following on from the success of last year’s competition when nearly a thousand spectators turned up for the final, allowing a very generous donation of £2500 to the Montagu Hospital Comforts Funds from the proceeds of the 2015 competition, Stelrad is again sponsoring this year’s Cup Final on Easter Monday – 28th March with an 11am kick off at Mexborough Athletic Ground. This year’s final will feature Houghton Main of the Sheffield & Hallamshire County Senior League and AFP from the Rotherham & District Sunday league. The outcome seems too close to call as both teams are enjoying a highly successful season so far. 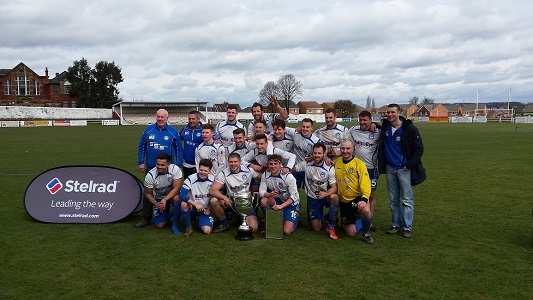 Houghton Main last played in the final in 2011 whereas AFP were winners of the competition in 2012, 2013 and 2014. Last year’s cup final crowd approached 1000 and with good weather this Easter Monday, there is no reason to believe that the game will not attract similar numbers this year. The game was played on Easter Monday following a pitch inspection to determine the condition of the playing surface following overnight rain. As predicted, a close game was anticipated which proved to be the case as the game was tied at 1.1 deep into the 2nd half. At this point AFP took control to run out winners 3.1. This win added to AFP’s outstanding record of achieving 4 successes in the last 5 years in this competition. A crowd of approximately 425 were treated to an excellent game of football as you would expect from these 2 highly successful teams.